BlackBerry Earrings? | BlackBerry Blast! BlackBerry Blast! > News > BlackBerry Earrings? What will they think of next? 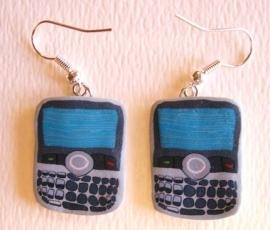 In case you've been dying to hang a pair of BlackBerry Bold's from your ears you're in luck. These BlackBerry earrings measure about 3/4 of an inch high and are made from Fimo, a polymer clay. "They were listed on Etsy, an online market for homemade goods, for $3 plus shipping, but they're sold out. Who is buying these?